There are a lot of local soap-makers in the Pioneer Valley, and most have their own unique take on this basic staple of our daily lives. Despite there being many proverbial fish to choose from in this sudsy sea, my heart belongs to the makers of Just Soap, a savonnier (hey, it sounds better than the English title of “soaper”) located in the pretty hill-town of Ashfield, MA. So, what’s special about Just Soap? 1. It’s made using a bicycle. Yup. For those who haven’t had the pleasure of making soap from scratch: it takes a lot of mixing to blend the oils and lye that magically combine to create soap. If you do it by hand, it can be exhausting. If you do it with an electric mixer, that takes electricity. They’ve also installed solar panels on their roof, and hope to generate much of the electricity for the rest of their operation with solar energy. True to its name, Just Soap is simple, and I love that about it. 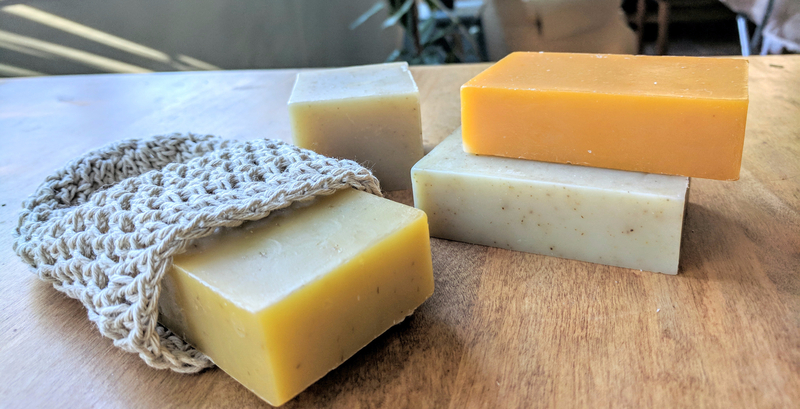 Sparkly soaps, soaps that look like rocks, soaps with coffee grounds—they’re fun for special gifts, but we go through a LOT of bar soap at our house and we appreciate a good-quality, natural soap at a reasonable price. Like many other natural bar soaps, it’s also waste-free and versatile. There are no plastic bottles, containers, or wrappers to deal with, and you can use it on face, hands, body, and home. My stash of Just Soap, with one snuggling in my homemade scrubbie pouch. 3. It’s all natural, including the scents. The company only uses vegetable oils (including sustainably-produced palm oil), essential oils, herbs, and spices to create their soap. I prefer products that have natural scents, and Just Soap comes in a variety of delish fragrance duos: lavender rosemary, cinnamon clove, oatmeal honey, sage fir, orange lemon, lemongrass ginger, peppermint, and almond cornmeal. 4. They make a shampoo bar! I was a little skeptical when initially trying a shampoo bar in place of my regular shampoo. I have fine, straight hair that tends to look greasy if it doesn’t get washed with shampoo every day, and my forays into all-natural, detergent-free shampoo hadn’t gone well (think: long-haired cat after a bath). The Rosemary Shampoo Bar for normal-to-oily hair lathered up richly in the shower, and I used a mild vinegar rinse afterward to help smooth out my hair. I’ve been using it for two weeks now, and my hair has more body than usual and doesn’t look greasy when I wake up in the morning. I feel like I’m a convert at this point, and even brought a slice of the bar on vacation with me. Where can you buy this glorious Western Mass product? It’s available in many local health food stores and shops that sell local goods, including River Valley Co-op in Northampton. You can also buy their soaps online—individually or in bulk at a discount! NOTE: I’m not paid by this company to review their product. I’ve never met them, but if they happen to read this post: I think you’re awesome and I like your soap.